I have the original body tag from my 48 CJ2A, 187089. The original Serial No tag is not the original and is different than the body. I understand the some bodies do not match serial numbers, but is their any way to determine when these numbers don't match from a time standpoint when they were built. If everything was original the numbers on the frame and body would match the serial number. The simple answer is that if a number is higher than the number you want to match it to than it is later and if lower, earlier. If everything was original the numbers on the frame and body would match the serial number. Hey John, would your Jeep be a “lefty”? Your number puts you pretty close the lefty range and if so you can pretty much nail when your Jeep was produced. Don't confuse an ACM number with a serial number. The ACM (American Central Manufacturing) number is on the left-hand body gusset and won't match the serial number. I'm not so sure about frame numbers and serial numbers matching as the original frame on Ol' Red was goober welded by Bubba right where the frame tag would have been. Not confusing ACM with Serial No. Body tag is approx. 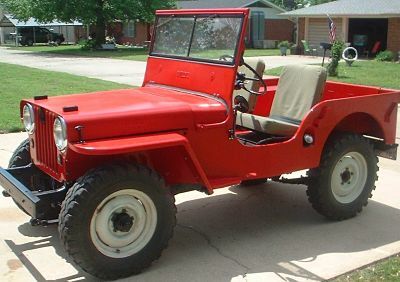 1 3/4 in X 1 1/4 in and is stamped WILLYS, and below that CJ2A BODY, and below that 187089. It is mounted on upper right firewall. It originally had the spare bracket on the pass side so I do not believe it is a lefty. There are not many entries in the database http://cj-2a.com/parts_list/CJ2A_data.php in the range of your Body Tag 187089. Looks like the Serial number would have been about 200000 or so. What number is stamped on the serial number tag (Patent Plate) that you have? Interesting that Serial No would be in the range of 200000. The registration and serial no plate are 197710. The serial plate is a copy rather then original and I have never been convinced it was correct. I'd say that the serial number is correct.